Aiming at improving efficacy of cancer therapy by effective tumor accumulation of therapeutic agents via the intrinsic enhanced permeability and retention (EPR) effect of solid tumors, various nanoparticle-based drug delivery systems (DDS) have been developed for the last two decades [1-8]. Despite the significant progresses in nanomedicine for targeted drug and bioimaging delivery, drawbacks including short blood circulation time, low drug bioavailability, and poor tumor penetration/uptake still severely limit the translation of these developments into clinic applications [9-11]. It has been recently demonstrated that coating hydrophilic poly(ethylene glycol) (PEG) and zwitterionic materials on the surfaces of nanocarriers can efficiently increase drug residence in blood circulation and thus tumor accumulation [12-16]. However, such modifications could impede the uptake of nanocarriers by cancer cells [12,13,15,16]. Although it has shown that positively surface-charged nanoparticles exhibited promoted uptake by cancer cells via electrostatic attractions, their application for drug delivery faces challenges because of their rapid body elimination, tissue toxicity and reduced tumor penetration [17,18]. Taking these facts into consideration, it is thus necessary to develop smart DDS that can elude non-specific protein adsorption during blood circulation, yet can actively be transformed into a more cell-interactive structure once localized and accumulated in tumor tissues. To this end, new strategies of engineering nano-scaled DDS with the capability of transforming surface charges from negative to neutral/positive in response to tumor extracellular acidity (pHe 6.0~7.0) have emerged [19-25]. Wang and co-workers developed a 2,3-dimethylmaleic anhydride (DMA)-modified nanogel with tumor acidity-activated charge conversion ability as a doxorubicin (DOX) carrier . Through the cleavage of the amide linkages between amine and DMA moieties under weak acidic conditions, the significant increase in surface positive charge enhanced cellular uptake of DOX-loaded nanogels and the cytotoxicity against cancer cells. 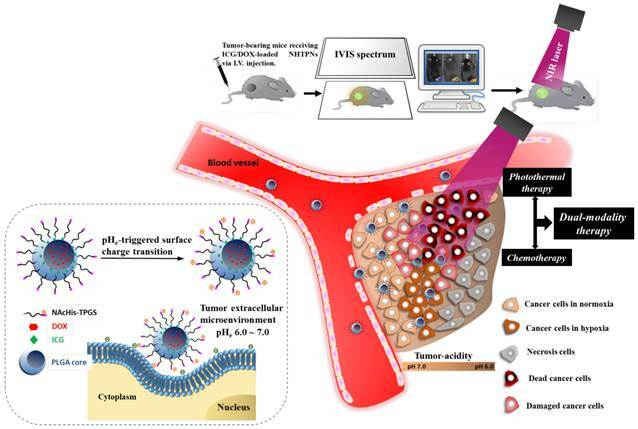 Also, they exploited the similar concept to attain surface charge switchable nanoparticles based on zwitterionic polymers for improved transport of DOX to tumors . As reported by Bae's group , the surface positive charges of paclitaxel (PTX)-carrying cationic micelles shielded by a negatively charged di-block copolymer at physiological pH can be exposed by pHe-triggered detachment of the surface copolymer, giving the unshielded PTX-loaded micelles a considerably enhanced tumor penetration and antitumor efficacy on MCF-7 tumor-bearing mice. In order to target tumor hypoxia, on the other hand, Dreaden et al. found that the tumor acidity-responsive hyaluronan nanoparticles, prepared by the layer-by-layer (LbL) electrostatic assembly technique, could undergo hypoxic pH-induced structural reorganization that exposed surface positive charges, leading to remarkable enhancement in tumor accumulation and penetration . Distinct from the aforementioned nanocarriers requiring time-consuming hydrolysis and detachment of the shielding materials, Zhang et al. have developed polymeric micelles featuring morpholino-rich surfaces that exhibit a rapid surface charge conversion at pH ranging from 7.0 to 6.5 via protonation of morpholino residues . The preparation of these DDS with pHe-responsive surface charge transition, nevertheless, frequently involves the use of complicate materials, excess organic solvents and multi-step procedures. In addition, most of these nanovehicles transport only a single chemotherapy with limited efficacy [19-21, 23, 25-28]. In order to enhance antitumor effect by the imaging-guided photothermal/chemo combined therapy, a practical approach was developed herein to prepare pHe-responsive surface charge-switchable nanoparticles capable of co-delivering a photothermal agent, indocyanine green (ICG), and a chemotherapy drug, DOX (Scheme 1). N-Acetyl histidine (NAcHis) modified D-α-tocopheryl polyethylene glycol 1000 succinate (TPGS) (NAcHis-TPGS), prepared by conjugating TPGS with NAcHis, was anchored via the hydrophobic vitamin E moiety at the surfaces of poly(lactic-co-glycolic acid) (PLGA)-based core particles concomitantly loaded with ICG and DOX. Through the small size (ca. 50 nm) in combination with the increase in surface positive charges due to the pHe-triggered protonation of NAcHis residues , the payload-carrying nanoparticles rapidly accumulated in acidic tumor tissued in vivo and penetrated into the deep tumor hypoxia regions upon the enhanced uptakes by both TRAMP-C1 cancer cells and tumor-associated macrophages (TAMs). Notably, the imaging-guided near-infrared (NIR)-triggered hyperthermia of the therapeutic nanoparticles accumulated at tumor sites in conjunction with chemotherapy efficiently inhibited tumor growth and recurrence, suggesting that the pHe-sensitive nanovehicles developed in this work are promising in advanced cancer theranostic applications. PLGA (LA/GA 85/15, I.V. 0.42 dl/g, hydroxyl terminated) was acquired from Green Square (Taiwan). TPGS, N,N'-dicyclohexylcarbodiimide (DCC), 4-dimethylaminopyridine (DMAP) and 3-(4,5-Dimethylthiazol-2-yl)-2,5-diphenyltetrazolium bromide (MTT) were supplied by Sigma-Aldrich (USA). NAcHis was purchased from Tokyo Chemical (Japan). DOX in HCl salt form was obtained from Seedchem (Australia) and ICG from Chem-Impex International (USA). Dulbecco's modified Eagle medium (DMEM), 4',6-Diamidino-2-Phenylindole (DAPI), Hoechst 33342, Alexa Fluor® 488, anti-mouse CD31 antibody, anti-HIF1α-fluorescein and rat anti-mouse CD11b antibody were purchased from Invitrogen (USA). Deionized water was produced from Milli-Q Synthesis (18 MΩ, Millipore). All other chemicals were reagent grade and used as received. Illustration of active tumor penetration and uptake of dual drug-loaded nanoparticles with pHe-triggered surface charge transition for the imaging-guided photothermal/chemo combinatorial therapy. TPGS (3 g, 2.0 mmol), NAcHis (1.97g, 10.0 mmol), DCC (1.24 g, 6.0 mmol) and DMAP (0.24 g, 2.0 mmol) were dissolved in anhydrous DMSO (10.0 mL). The reaction was carried out under stirring at 40 oC for 48 h, followed by repeated filtrations to remove the byproduct dicyclohexylcarbodiurea. The solution was then dialyzed (Cellu Sep MWCO 1000) against deionized water for 7 days to eliminate the residual NAcHis, DMAP and DMSO. The final product was obtained by lyophilization. To obtain hydrophobic DOX in free base form, DOX hydrochloride was stirred in dark overnight with excess triethylamine (1.5-fold excess in molar concentration with respect to DOX) in dry DMSO. Various cargo-loaded nanoparticles coated with either TPGS or NAcHis-TPGS were attained by the one-step nanoprecipitation approach. The NAcHis-TPGS/PLGA nanoparticles (denoted hereinafter as NHTPNs) loaded with ICG and DOX were attained as follows. PLGA (2.0 mg), DOX (0.4 mg) and ICG (0.4 mg) dissolved in DMSO (0.4 mL) were added dropwise into the pH 7.4 phosphate buffer (10 mM, 3.5 mL) containing NAcHis-TPGS (1.6 mg). The solution was stirred at 30 oC for 30 min, followed by an equilibration period of 30 min. The solution containing cargo-loaded NHTPNs was dialysed (Cellu Sep MWCO 12000-14000) against 10 mM pH 7.4 phosphate buffer at 4 oC to remove the residual DOX and ICG. For comparison, ICG-loaded, DOX-loaded and drug-free NHTPNs, ICG/DOX-loaded TPGS/PLGA nanoparticles (TPNs) without NAcHis conjugation, and ICG/DOX-loaded PLGA nanoparticles (PNs) were prepared in a similar manner. The particle size, size distribution and zeta potential of cargo-loaded nanoparticles in aqueous solutions were determined by dynamic light scattering (DLS) using a ZetaSizer Nano Series instrument (Malvern Instruments, U.K.). The data shown herein represented an average of at least triplicate measurements. The morphology of pristine and cargo-loaded nanoparticles was examined by transimission electron microscopy (TEM) (HT7700, Hitachi, Japan) after negative staining with uranyl acetate. The absorption spectra of free ICG and ICG-carrying nanoparticles in PBS were attained using a UV/Vis spectrophotometer (U2900, Hitachi, Japan). DLE (%) = (weight of drug loaded/weight of drug in feed) × 100%. DLC (%) = (weight of drug loaded/total weight of drug-loaded nanoparticles) × 100%. Various ICG-containing nanoparticles and free ICG species in PBS (1.0 mL) were irradiated with 808 nm NIR laser (1.0 W/cm2) for 10 min. The solution temperatures and infrared thermographic maps were recorded using an infrared thermal imaging camera (Thermo Shot F20, NEC Avio Infrared Technologies, Germany). Cumulative ICG release (%) = ((Initial ICG absorbance - ICG absorbance at the predetermined time points)/Initial ICG absorbance) × 100%. For DOX liberation evaluation, the DOX-containing nanoparticle dispersion (1.5 mL) was dialyzed (Cellu Sep MWCO 12000-14000) against PBS (pH 7.4, 40 mL) and succinic acid buffer (pH 6.0, 40 mL) at 37 oC, respectively. At the prescribed time intervals, 0.7 mL of dialysate (pH 6.0 or 7.4) was taken for analysis and replaced with an equal volume of fresh buffer. The amount of DOX released was determined by fluorescence measurements. TRAMP-C1 cells (1×105 cells/well) were seeded in a 24-well plate and incubated in DMEM containing 10% FBS and 1% penicillin at 37 oC for 24 h. The spent medium was then replaced with 1.0 mL of fresh DMEM containing free ICG, free DOX or various nanoformulations and was further incubated for additional 24 h. After being washed twice with PBS, cells were detached with trypsine-EDTA and centrifuged. The cell pellets thus collected were dispersed in DMEM (20 μL) and the dispersion was irradiated with 808 nm NIR laser (1.0 W/cm2) for 5 min. The laser-treated cells were reseeded in a 96-well plate and re-incubated for 24 h. MTT (0.25 mg/mL, 200 μL) was then added into each well, followed by incubation at 37 oC for 4 h. After discarding the culture medium, DMSO (200 μL) was added to dissolve the precipitate and the resulting solution was measured for absorbance at 570 nm using a SpectraMax M5 microplate reader. 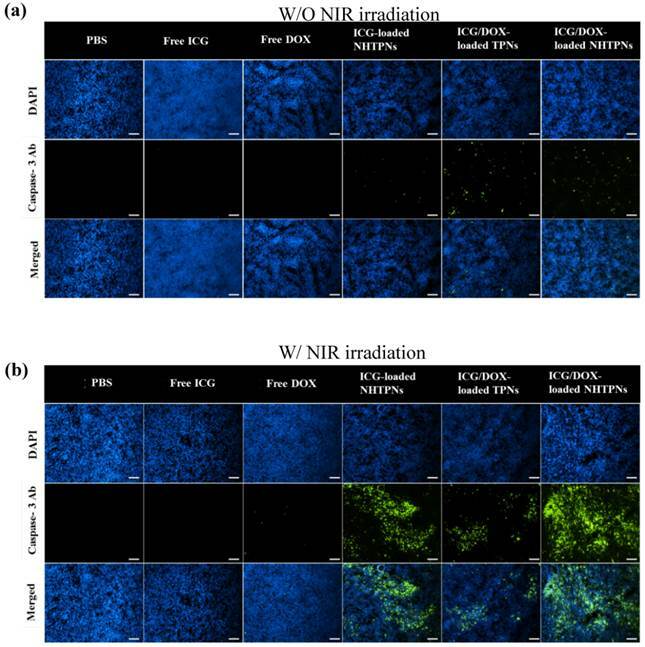 The viability of TRAMP-C1 cells treated with different nanoformulations without NIR laser irradiation was evaluated in a similar manner. Male C57BL/6J mice (6~8 weeks old), purchased from National Laboratory Animal Center (Taiwan), were cared in accordance with the Guidance Suggestions for the Care and Use of Laboratory Animals, approved by the Administrative Committee on Animal Research in the National Tsing Hua University (Taiwan). To establish tumor model, 2×107 TRAMP-C1 cells were subcutaneously injected into the right thigh of mice. Two weeks post-inoculation, the low permeability tumor model was established. Tumor volume (V) was calculated as follows: V = L × W2/2, where W is the tumor measurement at the widest point and L the tumor dimension at the longest point. When the tumor volume reached 100~120 mm3, PBS, free ICG, or various nanoformulations were injected into the mice via tail vein at an ICG dosage of 1.6 mg/kg. The fluorescence signals of ICG (Ex. 745 nm and Em. 810 nm) at 2, 4, 6, 24 and 48 h post-injection were collected on the IVIS. The treated mice were then sacrificed and the major organs harvested for individual organ imaging by IVIS. The tumor-bearing mice receiving free DOX, ICG/DOX-loaded NHTPNs and TPNs with and without NIR irradiation were scarified 48 h post-injection. The tumors were harvested and stored for cryo-section. Rat anti-mouse CD31, anti-hypoxia-inducible factor (HIF) 1α and rat anti-mouse CD11b, and, with Alexa Fluor 488® goat anti-rat as the secondary antibody, were used for the immunohistochemical (IHC) identifications of tumor neovessel, hypoxia and TAM, respectively, in the cryo-sections. The cell nuclei were stained with DAPI. All stained tumor sections were examined by Nikon ECLIPSE Ti-U inverted microscope with the fluorescence channels for DAPI, Alexa Fluor 488 and DOX. The protocol for the in vivo distribution studies was followed, with the exception that the tumor site of mice was irradiated with 808 nm laser with a power density of 1.0 W/cm2 for 5 min at 6 h post-injection. The tumor local temperature was monitored by infrared thermal imaging camera. When tumor volume of the mice reached 100~120 mm3, the mice were randomly divided into six groups (10 in each group) and separately treated by I.V. injection with PBS, free ICG, free DOX, ICG-loaded NHTPNs, ICG/DOX-loaded NHTPNs and TPNs at an ICG dosage of 1.6 mg/kg or, in the case of free DOX, 1.8 mg DOX /kg. Six h post-injection, the mice (5 in each group) were irradiated at the tumor sites with 808 nm laser (1.0 W/cm2) for 5 min. The tumor volumes of various groups were measured daily and normalized against the original volumes to assess the antitumor efficacy. The body weight of mice was also monitored daily until 15 days post-injection. The tumors were then isolated from the euthanized mice and weighted for therapeutic index (TI) measurements. The TI defined below was utilized as a quantitative measure of therapeutic efficacy. Sections of tumors and major organs of pertinent sizes were H&E stained and examined by an Olympus IX70 inverted microscope (Japan). Data were reported as mean ± SD. The differences among groups were determined using one-way ANOVA analysis; (*) P < 0.05, (**) P < 0.005 and (***) P < 0.001. The NAcHis-TPGS employed in this study was prepared by the DCC/DMAP mediated esterification of TPGS with NAcHis. The detail synthetic route of NAcHis-TPGS and its 1H-NMR characterization are illustrated in Figure S1 (Supplementary Materials). Based on the integral ratio of the feature proton signals of imidazole ring (7.55 ppm) of NAcHis and the methyl groups (0.81 ppm) of TPGS, the coupling efficiency was estimated to be ca 95%. The yield is above 85 %. 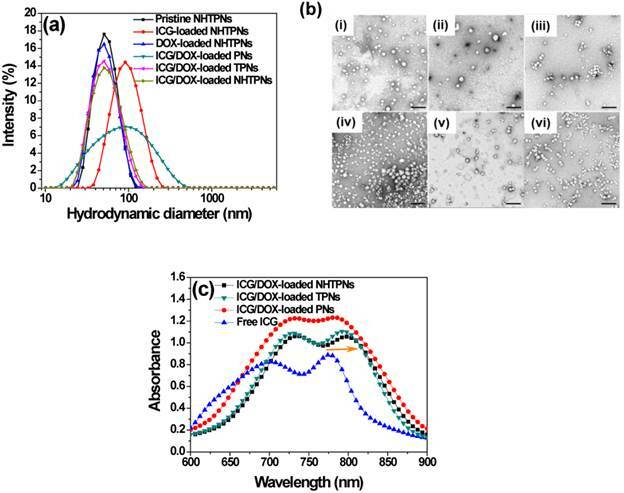 The DOX/ICG-loaded nanoparticles coated with either NAcHis-TPGS (NHTPNs) or TPGS (TPNs) exhibited comparable mean hydrodynamic diameters (Dh) of ca 50 nm and mono-modal size distributions (PDI ca 0.11) in aqueous solution (pH 7.4) (Figure 1a and Table 1). The TEM images further revealed that these nanoparticles were well-dispersed and spherical (Figure 1b), indicating that the TPGS adduct retained the amphiphilic property of the parent compound, and thus was able to anchor on the PLGA particles via the hydrophobic vitamin E moieties and to stabilize the nanoparticles in aqueous solution with PEG segments. By contrast, due to the lack of TPGS or its adduct coating on particle surfaces, the resulting ICG/DOX-loaded PNs readily aggregated in aqueous phase as reflected by their enlarged particle size characterized by both DLS (Figure 1a and Table 1) and TEM (Figure 1b). The coating of either TPGS or its NAcHis conjugate on PLGA particles remarkably enhanced the loading efficiencies of ICG and DOX (Table 1), most likely because of the association of ICG and DOX, respectively, with the vitamin E moiety of TPGS through either π-π aromatic and hydrophobic alkyl stacking, although the orientation of these molecules on molecular level is currently not clear. This hypothesis was supported by the observation that, when ICG molecules were incorporated into the nanoparticles coated with TPGS or NAcHis-TPGS, the feature absorption peak of ICG was appreciably shifted from 776 to 794 nm (Figure 1c) by their association with the hydrophobic alkyl chains of TPGS. Similar findings have also been reported elsewhere [30,31]. To evaluate the aqueous photostability of ICG associated with PLGA-based nanoparticles, the change in absorbance of the ICG-containing nanoparticles in PBS (pH 7.4, I = 0.15 M) at 37 oC was monitored. The maximum absorbance of ICG at each time point relative to that at the beginning (Figure 2a) was obtained from the time-evolved absorption spectra, illustrated in Figure S2. While the normalized absorbance of free ICG decreased considerably over 7 days, only a slight change in absorbance was observed for ICG-containing nanoparticles. The promoted photostability was primarily ascribed to the protective effect of PLGA nanoparticles serving as the ICG dispersion matrices that prevented ICG from rapid self-aggregation and degradation in aqueous phase [30,31]. Distinct from a severe aggregation of ICG/DOX-loaded PNs upon 4-day incubation in PBS, the particle sizes of cargo-carrying NHTPNs and TPNs remained essentially unchanged over a time period of 7 days (Figure 2b). The results further demonstrate the effect of the surface elaboration with TPGS or NAcHis-TPGS on the colloidal stability of PLGA nanoparticles in aqueous phase. (a) DLS particle size distribution profiles of nanoparticles in aqueous solution of pH 7.4. (b) TEM images of (i) pristine NHTPNs, (ii) ICG-loaded NHTPNs, (iii) DOX-loaded NHTPNs, (iv) ICG/DOX-loaded PNs, (v) ICG/DOX-loaded TPNs and (vi) ICG/DOX-loaded NHTPNs. Scale bars are 200 nm. (c) UV/Vis spectra of free ICG, ICG/DOX-loaded NHTPNs, TPNs and PNs in PBS. DLS Data and Drug Loading Characterics of Cargo-Loaded Nanoparticles. (a) Normalized maximum absorbance of free ICG and various ICG-containing nanoparticles in PBS at 37 oC. (b) Time-evolved mean hydrodynamic diameters (Dh) of various cargo-loaded nanoparticles in PBS at 37 oC. (c) Temperature profiles and (d) thermal images of free ICG and ICG-containing nanoparticles (ICG concentration = 10 μM) in PBS with 808 nm NIR laser irradiation (1.0 W/cm2). The NIR-triggered hyperthermia capability of free ICG and ICG-loaded PLGA nanoparticles was examined by monitoring the temperature of the aqueous solution upon receiving laser irradiation at 808 nm. Upon NIR laser irradiation (power density of 1.0 W/cm2) for 120 s, the temperatures of ICG/DOX-carrying NHTPN and TPN solutions were appreciably raised compared with those of the ICG/DOX-loaded PN and free ICG solutions (Figure 2c and d), due largely to the red-shift in the absorption of ICG embedded within NHTPNs and TPNs that better matched the central wavelength (808 nm) of the diode laser used . As expected, the level of temperature increase, a direct measure of NIR-triggered hyperthermia, increased with the concentrations of ICG-loaded NHTPNs and TPNs (Figure S3). The temperatures of all ICG-containing solutions declined gradually 3 min after irradiation due to photo-bleaching and thermal degradation of ICG [32, 33]. With the medium pH being adjusted from 7.4 to 5.0, conversions in zeta potentials of pristine and payload-carrying NHTPNs from negative to nearly neutral or slightly positive values were observed (Figure 3a), due to the enhanced protonation of the imidazole groups of the NAcHis-TPGS segments. By contrast, due to the lack of pH-sensitive moiety in TPGS, no significant variation in the zeta potential of cargo-loaded TPNs in response to pH change was observed. While both the pristine and DOX-loaded NHTPNs became positively charged on their surfaces in response to the pH adjustment to 5.0, the same pH stimulation only rendered the surfaces of NHTPNs carrying either ICG alone or both ICG/DOX nearly neutral, yet still mildly negatively charged, due to the sulfonate groups of ICG present mainly on colloidal surfaces. Most of the DOX species were not involved in charge variations as they remained in free base form, rendering themselves hydrophobic and entrapped within the inner core of NHTPNs (Scheme 1). Notably, the mean particle sizes of the cargo-loaded NHTPNs and TPNs remain essentially invariant in the medium pH range 5.0~7.4, as partly illustrated in Figure 3b. This is particularly important that the ICG/DOX-loaded NHTPNs which exhibit neutral surfaces, maintained a particle size of ca 50 nm in Dh when exposed to the weak acidic environment (pH 6.0) close to pHe (Figure 3b), a critical prerequisite for the infiltration into deep tumor tissue in vivo [34-36]. (a) Zeta potential of pristine and cargo-loaded nanoparticles in aqueous solutions. (b) DLS particle size distribution profiles of ICG/DOX-loaded NHTPNs in aqueous solutions. (c) Cumulative ICG release profiles of various cargo-loaded nanoparticles in PBS at 37 oC. (d) Cumulative DOX release profiles of ICG/DOX-loaded NHTPNs and TPNs in aqueous solutions of pH 7.4 and 6.0. Compared to rapid diffusion of free ICG across the dialysis tube in PBS (>80% over 5 h), the ICG liberation from cargo-loaded nanoparticles under the same conditions was considerably retarded, in particular for those nanoparticles elaborated by TPGS or its NAcHis conjugate (Figure 3c), which can be ascribed to the association of ICG with the vitamin E moiety of TPGS or NAcHis-TPGS on particle surfaces as described above. 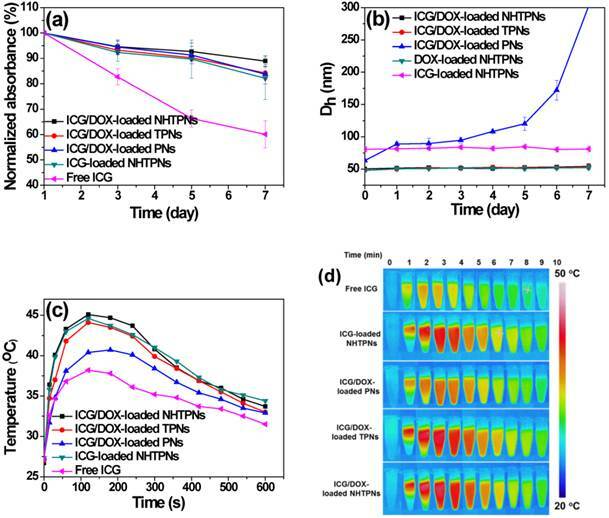 In contrast to the frequently observed strong pH-dependent release of DOX (in salt form) from pH-responsive polymeric delivery carriers, the DOX release profiles of ICG/DOX-loaded NHTPNs and TPNs were slower and independent of medium pH (Figure 3d), as the hydrophobic DOX was localized primarily within the solid PLGA cores of the nanoparticles. It can thus be presumed that the DOX release profile relied in large measure on the degradation rate of PLGA composing the hydrophobic cores of ICG/DOX-loaded nanoparticles. The effect of pH-responsive surface charge transition of the cargo-carrying NHTPNs on their cellular uptake was studied using TRAMP-C1 cells as a cell model. When the culture pH was adjusted from 7.4 to 6.3, the NIR fluorescence intensity of ICG molecules from TRAMP-C1 cells treated with ICG/DOX-loaded NHTPNs was significantly enhanced compared with the cancer cells incubated with either ICG/DOX-loaded TPNs or free ICG (Figure 4a). 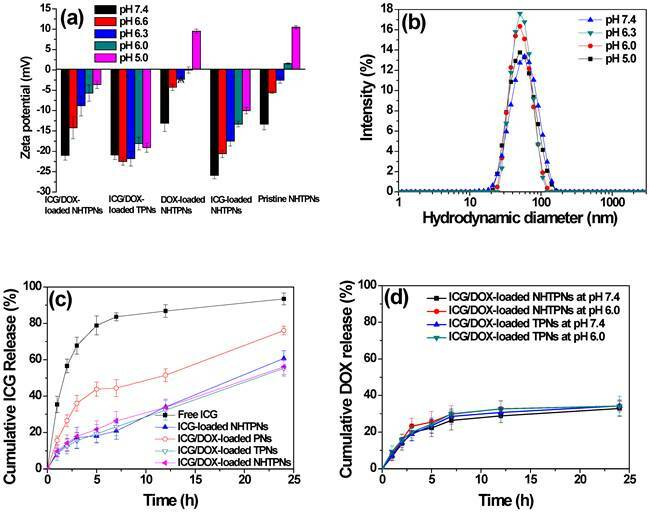 The amount of intracellular DOX of TRAMP-C1 cells incubated with ICG/DOX-loaded NHTPNs was ca 1.5-fold enhanced in response to the pH reduction from 7.4 to 6.3 (Figure 4b), while those of cells treated with either free DOX or ICG/DOX-loaded TPNs were virtually pH independent. The pH-dependent increase in cellular uptake of ICG/DOX-loaded NHTPNs was also confirmed by flow cytometric histograms (Figure 4c). The results strongly suggest that the payload-carrying NHTPNs can effectively promote the intracellular cargo delivery under weak acidic conditions due to the enhanced affinity for cancer cells mediated by the positive charges of NAcHis-TPGS extending into surrounding aqueous phase from the negatively charged surfaces of ICG-embedded PLGA-based nanoparticles. The same findings were attained with another cell model, human breast MCF-7 cancer cells (Figure S4). In agreement with these observations, the fluorescence images show that DOX delivered by NHTPNs at pH 6.3 was found appreciably in the cytoplasm and nuclei of TRAMP-C1 cells, whereas relatively small amounts of DOX transported by either NHTPNs at pH 7.4 or by TPNs at both pH 7.4 and 6.3 were observed intracellularly (Figure 4d). Compared to ICG/DOX-loaded NHTPNs found largely in cytoplasm and cell nuclei, free hydrophobic DOX molecules were mostly localized within cell membrane (Figure S5), consistent with the observation by Gu's group . In addition, an appreciably higher cellular uptake of free DOX than that of DOX carried by NHTPNs or TPNs at pH 7.4 was observed (Figure 4b). Such differences are resulting mainly from the distinctive cellular uptake pathways for DOX species transported by NHTPNs (endocytosis) and for free DOX molecules (passive diffusion) [6, 37-40]. To study the therapeutic efficacy of ICG-based photo-triggered hyperthermia combined with DOX chemotherapy, the viability of TRAMP-C1 cells treated with NHTPNs carrying single- and dual-modality therapy at pH 7.4 was determined by MTT assay. TRAMP-C1 cells alone exposed to NIR laser irradiation as a control group retained the viability above 95%, being indicative of the harmlessness of NIR laser to cancer cells. While free ICG-treated TRAMP-C1 cells retained a mean viability above 90 %, the viability of TRAMP-C1 cells incubated with ICG-loaded NHTPNs was significantly reduced upon NIR activation (Figure 5a), indicating that NIR activation of ICG delivered by NHTPNs displayed strong thermal ablation on TRAMP-C1 cells. This is primarily attributed to the superior photo-triggered hyperthermia ability and photostability of the ICG delivered by NHTPNs in comparison with free ICG (Figure 2). 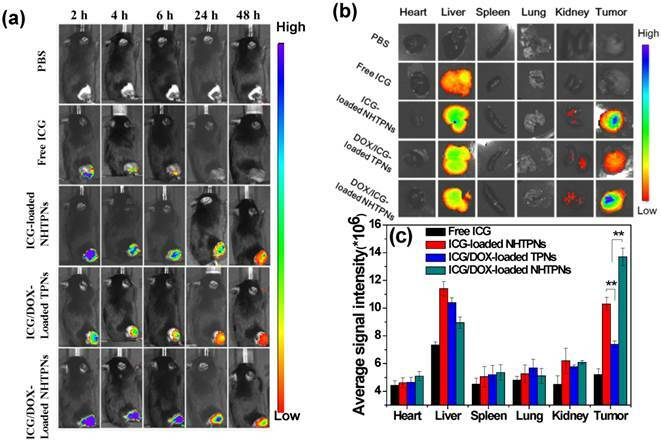 Figure 5a also shows that, at a DOX concentration of 11 μM without NIR irradiation, the ICG/DOX-loaded NHTPNs exhibited higher cytotoxicity against TRAMP-C1 cells (ca 40 % cell death) than free DOX (15 %), due to the promoted intracellular transport of DOX via endocytic uptake of NHTPNs to cellular nuclei in contrast to the diffusion-based accumulation of free hydrophobic DOX within cell membranes, as shown in Figure 5S. (a) Fluorescence images of ICG molecules from TRAMP-C1 cells incubated with free ICG and ICG/DOX-loaded TPNs and NHTPNs, respectively, under different pH conditions attained by IVIS. (b) Intracellular DOX amount of TRAMP-C1 cells incubated with various DOX formulations. (c) Flow cytometric histograms TRAMP-C1 cells treated with ICG/DOX-loaded TPNs and NHTPNs at pH 7.4 and 6.3 for 2 h (DOX concentration = 20 μΜ). (d) Fluorescence images of TRAMP-C1 cells incubated with ICG/DOX-loaded TPN and NHTPNs at pH 7.4 and 6.3 for 1.5 h (DOX concentration = 10 μΜ). Nuclei and F-actin cytoskeleton were stained with Hoechst and F-actin marker, respectively. Scale bar is 50 μm. (a) Cell viability of TRAMP-C1 cells incubated with various formulations for 24 h with and without the 5-min NIR laser irradiation, followed by additional 24 h incubation. (b) Cell viability of TRAMP-C1 cells incubated respectively with ICG-loaded NHTPNs and ICG/DOX-loaded NHTPNs (ICG 5.0 μM and DOX 5.5 μM, if applicable) at pH 7.4 and 6.3. Moreover, in the absence of NIR laser irradiation, the comparable cytotoxicity of ICG/DOX-loaded NHTPNs against TRAMP-C1 cells to DOX-loaded NHTPNs indicates that the presence of ICG has little influence on cancer chemotherapy efficacy of DOX released from NHTPNs. With NIR irradiation, the ICG/DOX-loaded NHTPNs showed the highest efficacy in inhibiting the proliferation of TRAMP-C1 cells by combined photothermal/chemo therapy. On the other hand, as revealed in Figure 5b, after NIR laser irradiation, the viability of TRAMP-C1 cells incubated respectively with ICG/DOX-loaded NHTPNs and ICG-loaded NHTPNs at pH 6.3 was appreciably reduced compared to the cells treated at pH 7.4. 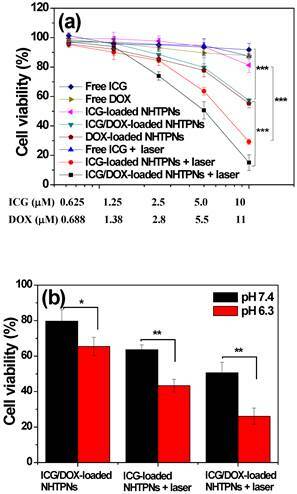 In the absence of NIR laser irradiation, the enhanced cytotoxicity of ICG/DOX-loaded NHTPNs in response to the change of culture pH from 7.4 to 6.3 was also observed. The results clearly demonstrate the promotion of anticancer effect from payload-containing NHTPNs by virtue of the increased intracellular concentrations of therapeutic agents upon acid-activated cellular uptake. The effects of the pHe-responsive surface charge transition of cargo-loaded NHTPNs on in vivo tumor accumulation and biodistribution were further evaluated using the subcutaneous TRAMP-C1 tumor model in male C57BL/6J mice. The ICG/DOX-loaded TPNs which lacked NAcHis elaboration were used as the control. 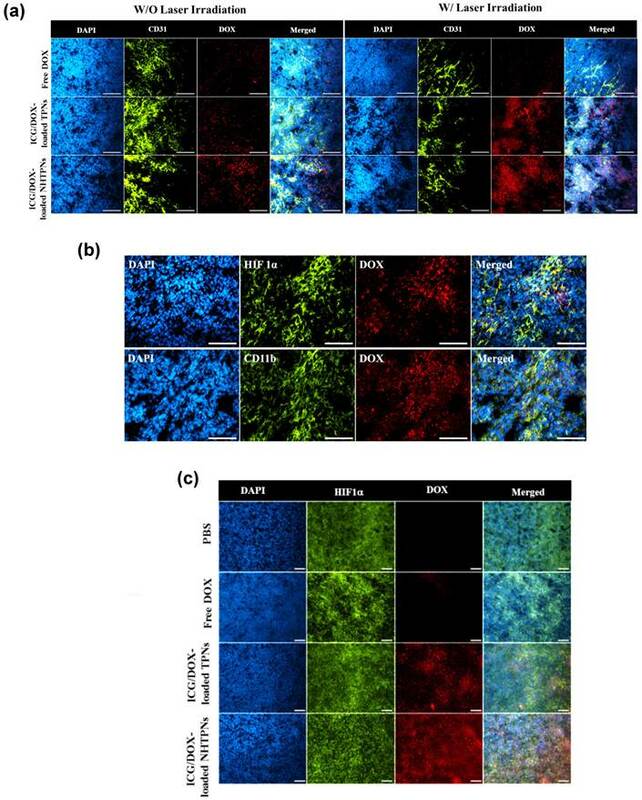 Upon intravenous injections with various nanoparticles loaded with either ICG alone or both ICG/DOX, the cargo accumulation in tumor regions of the tumor-bearing mice was examined by intravital ICG fluorescence imaging. Compared to the weak fluorescence signal in the tumor regions of the free ICG group at 6 h post-injection, the intense fluorescence signals of the NHTPN and TPN groups over the identical time period were detected (Figure 6a). The signals lasted even for 48 h after injection. This demonstrates the pronounced ability of NHTPNs and TPNs in promoting their accumulation in tumor areas by virtue of the EPR effect and in protecting ICG from degradation and body clearance. It should be noted that the ICG fluorescence intensities at the tumor sites of the two NHTPN groups were appreciably higher than that of the TPN group over the time course. The ex vivo NIR fluorescence signal of tumor receiving free ICG was not detected at 48 h post-injection, while the tumors from the NHTPN groups with the loaded cargo of either ICG alone or ICG/DOX exhibited higher fluorescence intensities than that from the group receiving the ICG/DOX-loaded TPNs (Figure 6b and c). Since the particle sizes of the ICG/DOX-loaded NHTPNs and TPNs were essentially identical (ca 50 nm in Dh as shown in Table 1), the significantly enhanced tumor accumulation of the former is attributed to the increased surface positive charges from protonation of NAcHis (imidazole) residues by the tumor extracellular acidity. This is consistent with the biodistribution profiles of the NHTPNs carrying ICG/DOX (Figure 6b and c), showing that the ex vivo ICG fluorescence intensity was higher in tumor than that in liver. Similar biodistribution of ICG delivered by functionalized nanocarriers has been attained [30,31]. By contrast, owing to the reduced tumor uptake by the lack of NAcHis residues, an appreciably enhanced accumulation of cargo-loaded TPNs in liver rather than in tumor was observed. These results indicate that the NHTPNs can greatly promote the tumor-targeted delivery of ICG and DOX, thus holding promise for improved cancer theranosis. Furthermore, the slightly increased tumor accumulation of ICG/DOX-loaded NHTPNs compared to ICG-loaded NHTPNs was attributed to the small particle size (Figure 1a) and the nearly neutral surfaces of ICG/DOX-loaded NHTPNs (Figure 3a) in tumor weak acidic environment which promote their tumor uptake upon the enhanced penetration ability and affinity with cancer cells. (a) In vivo NIR fluorescence images of TRAMP-C1 tumor-bearing mice receiving intravenous injection of PBS and different ICG-containing formulations evaluated by IVIS. (b) NIR fluorescence images of the isolated major organs and tumors 48 h post-injection with PBS and different ICG-containing formulations. (c) Average ICG fluorescence intensities of individual organs and tumor from TRAMP-C1 tumor-bearing mice treated with different ICG-containing formulations (n = 5 per group). To assess the tumor penetration ability of cargo-carrying nanoparticles, their intratumoral distribution was attained by IHC staining of tumor tissue sections. 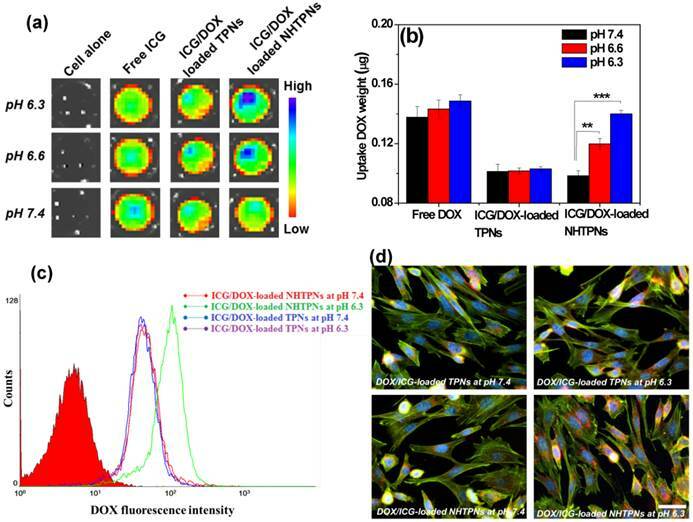 The tumors receiving the ICG/DOX-loaded NHTPNs and TPNs exhibited appreciably higher DOX fluorescence intensity than that receiving free DOX regardless of NIR irradiation (Figure 7a), further illustrating the superior tumor accumulation of the nanoformulations via the EPR effect. The DOX fluorescence signal from the ICG/DOX-loaded NHTPN treatment was more intense within tumor and farther in distance from the CD31-identified tumor blood vessels than that treated with the TPN counterpart, suggesting that the extravasated NHTPNs from tumor neovessels were substantially uptaken by cancer cells and, for the rest not internalized by cancer cells, readily penetrated into the deep cell-dense tumor region due to their small size and pHe-induced near-neutral surface. By contrast, the TPNs were localized mostly in the vessel periphery due to their negative charge-rich surfaces which impeded tumor uptake and permeation [35,36]. The DOX fluorescence intensity was significantly enhanced when tumors treated with ICG/DOX-loaded NHTPNs and TPNs were subjected to additional NIR irradiation, because the photo-triggered hyperthermia could not only disrupts the dense tumor extracellular matrix but also promote the permeability of tumor angiogenic vessels, thus facilitating tumor accumulation of nanoparticles. Similar viewpoints have also been reported elsewhere [41,42]. Although we have confirmed the deep tumor penetration of NHTPNs, whether the payload-carrying NHTPNs can further infiltrate into deep tumor hypoxia regions, with a weak acidic microenvironment of ca pH 6.0 and a distance as far as 150 μm from the neovessels, needs to be verified [22,43]. As shown in Figure 7b, the localization of ICG/DOX-loaded NHTPNs within the HIF 1α positive areas implies the presence of NHTPNs in the deep tumor hypoxia. The HIF 1α-identified tumor hypoxia correlated well with the contiguous tumor section stained with a CD11b marker, suggesting that the transport of NHTPNs from vessel periphery into tumor hypoxia may involve cellular cargo pickup via the hypoxia-homing recruitment of TAMs [36, 44-47]. By contrast, the access of ICG/DOX-loaded TPNs and free DOX to tumor hypoxia was severely restricted (Figure 7c). It was further postulated that the difference in accessibility of tumor hypoxia to the two nanoparticles as observed in Figure S6 was caused predominantly by the increased surface positive charges of NHTPNs in the tumor acidic microenvironment and thus the cellular midway uptake by TAMs. The results of in vitro cellular uptake study using RAW 264.7 cells (mouse leukemic monocyte macrophage cell line) show a dramatic enhancement in ICG fluorescence intensity for RAW 264.7 cells incubated with cargo-loaded NHTPNs with medium pH adjustment from pH 7.4 to 6.3 (Figure S7), compared with only a limited increase in ICG fluorescence intensity for the cells treated with the TPN counterpart. As postulated, the acidity-triggered surface charge conversion of NHTPNs indeed facilitated their uptake by macrophages. The enhanced internalization of free ICG by RAW 264.7 cells at pH 7.4 (Figure S7) was a result of extensive self-aggregation that facilitated the phagocytic uptake. (a) Intratumoral distribution of free DOX and ICG/DOX-loaded TPNs and NHTPNs in relation to the loci of angiogenic blood vessels examined by immunofluorescence microscopy. (b) Intratumoral distribution of ICG/DOX-loaded NHTPNs in relation to the loci of tumor hypoxia and TAM by IHC examination of contiguous tumor sections. (c) Intratumoral distribution of free DOX and ICG/DOX-loaded TPNs and NHTPNs in relation to the loci of tumor hypoxia examined by immunofluorescence microscopy. Tumor cell nuclei, angiogenic blood vessels, tumor hypoxia and TAM were stained with DAPI and CD31, HIF 1α and CD11b markers, respectively. Scale bars are 50 μm in (a) and 100 μm in (b and c). (a) Temperature profiles and (b) infrared thermographic maps at the tumor sites of TRAMP-C1 tumor-bearing mice receiving various formulations and exposed to NIR laser irradiation of 1.0 W/cm2 6 h post-injection. Due to the enhanced accumulation of ICG-containing NHTPNs and TPNs at TRAMP-C1 tumor sites via the EPR effect (Figure 6), a significant rise in local tumor temperature upon NIR laser irradiation (1.0 W/cm2) at 6 h post-injection was observed (Figure 8). Because of the low intratumoral ICG concentration, the tumor temperature of free ICG-treated mice under NIR irradiation was only slightly higher than that of the control group injected with either free DOX or PBS. Notably, compared to all other ICG-containing formulations, the extensive accumulation of ICG/DOX-carrying NHTPNs in tumor (Figures 6 and 7) led to the most profound NIR-triggered hyperthermia on tumor within which a temperature as high as 60.2 oC was attained (Figure 8). Hyperthermia above 50 oC can readily induce irreversible damage to cancer cells, as reflected by the burning scar at the irradiated tumor sites at day 6 post-treatment (Figure S8). The photo-evolved hyperthermia of ICG- and ICG/DOX-loaded NHTPNs within tumor tissues not only led to extensive cell necrosis, but also prominently induced cell apoptosis, as shown by a remarkable increase in the level of caspase-3 protein, a key molecular indicator for cells undergoing the apoptotic pathway (Figure 9). As reported elsewhere [41, 42, 48], hyperthermia can induce sublethal damages and subsequent apoptosis of cancer cells located in the outer peripheral zones of laser-irradiated tumor sites, in addition to the increased blood flow which, in turn, can further facilitate the tumor accumulation of therapeutic nanoparticles. The in vivo antitumor efficacies of various formulations in terms of the change of tumor volume of the TRAMP-C1 tumor-bearing mice were evaluated for up to 15 days post intravenous injection. Little change in body weight of the treated mice over time in all groups was observed, revealing that the formulations adopted in this study did not induce severe acute toxicity (Figure S9). The tumor volumes (V) were normalized against their original volumes (Vo) to obtain the relative tumor volumes (V/Vo). As shown in Figure 10a, 15 days after treatment, a 22~26-fold increase in the relative tumor volume of mice treated with either free DOX or ICG with laser irradiation was observed, indicating the failure of tumor growth inhibition due to poor tumor accumulation of ICG and DOX. By contrast, the administration of NHTPNs loaded with either ICG alone or ICG/DOX combined with laser irradiation led to an appreciable suppression on tumor growth up to 7 days post injection, beyond which tumors treated with ICG-loaded NHTPNs gradually enlarged, due to the proliferation of residual cells surviving the single-dose photothermal therapy. For the group treated with ICG/DOX-loaded NHTPNs without irradiation, the single DOX chemotherapy was incapable of inhibiting tumor growth. By combining the NIR-triggered hyperthermia and DOX chemotherapy, nevertheless, the ICG/DOX-loaded NHTPNs significantly retarded tumor growth with only a slight tumor recurrence at the end of treatment. On the other hand, the dual-modality therapy delivered by TPNs failed to effectively inhibit tumor growth due to its poor tumor accumulation and cellular uptake, as demonstrated in Figures 6 and 7. 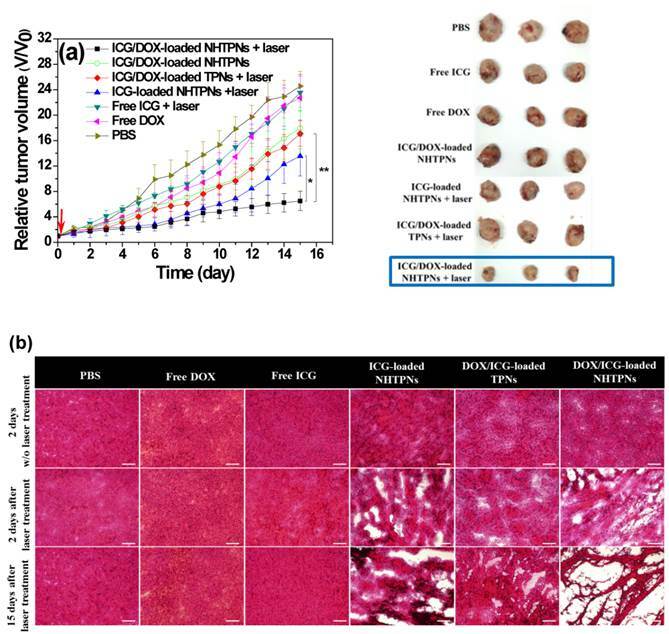 Based on the superior performances of ICG/DOX-loaded NHTPNs in intratumoral distribution and tumor growth inhibition, it is concluded that the photo-evolved hyperthermia not only induces effective thermal ablation of cancer cells but also promotes DOX penetration throughout the tumor, thus substantially inhibiting cancer cell proliferation. In agreement with the results of the in vivo tumor growth inhibition, tumors harvested from the sacrificed mice receiving ICG/DOX-loaded NHTPNs and NIR irradiation were the smallest among the tumors receiving other treatments (Figure 10a). As shown in Table S1, the average TI (ca 73.5 %) of the combinatorial therapy provided by ICG/DOX-loaded NHTPNs with NIR activation was appreciably higher than that without NIR irradiation (26.9 %) and that of ICG/DOX-loaded TPNs with NIR illumination (30.3 %). This further demonstrates that the dual-modality therapy delivered by ICG/DOX-loaded NHTPNs exhibited the highest antitumor efficacy. As illustrated by H&E staining of the tumor sections (Figure 10b), TRAMP-C1 tumor tissue receiving PBS and laser irradiation showed the same histologic features compared to the group without illumination, indicating that the NIR irradiation (1 W/cm2) by itself was essentially harmless to the tissue. Tumors treated with either free ICG or DOX along with laser irradiation showed no apparent tissue damage primarily because of the lack of tumor targeting and thus the low drug accumulation in tumors. Upon laser irradiation, tumors receiving ICG/DOX-loaded NHTPNs exhibited more severe cell necrosis and extensive hemorrhagic inflammation as compared to those treated with either ICG/DOX-loaded TPNs or ICG-loaded NHTPNs. Compared to the ICG-loaded NHTPN treatment, the damage to tumor tissue receiving ICG/DOX-loaded NHTPNs was significantly enhanced, thereby clearly demonstrating the therapeutic effect of the chemotreatment, most likely with the aid of photo-triggered hyperthermia in enhancing DOX penetration into deep tumor tissue and in accelerating PLGA degradation. Upon the treatment with the photothermal therapy from ICG-loaded NHTPNs, the H&E examination of tumor sections showed only sporadic necrotic regions along with occasional appearances of pyknosis. No apparent abnormality was observed in major organs, particularly in liver of mice treated with all nanoformulations, because the NIR irradiation as a hyperthermia trigger was applied exclusively on tumors only (Figure S10). These results strongly suggest that the imaging-guided photothermal/chemo combinatorial therapy of ICG/DOX-loaded NHTPNs developed herein not only can significantly reduce side effects on normal tissues, but also display a sound anti-tumor efficacy. Fluorescence images of tumor sections from the mice bearing TRAMP-C1 tumor 48 h post-injection of various formulations (a) without and (b) with NIR irradiation. Cell nuclei and apoptotic cells were stained with DAPI (blue) and caspase-3 marker (green), respectively. Scale bars are 100 μm. (a) Tumor growth inhibition profiles of the mice bearing TRAMP-C1 tumor injected with various formulations, followed by NIR laser irradiation (5 min, 1.0 W/cm2) 6 h post-injection or without any laser treatment (n = 4 per group). Morphology and size of the tumors of each group isolated from the sacrificed mice at day 15 (the end point) after the treatment. (b) Images of H&E-stained tumor sections harvested from the tumor-bearing mice receiving treatments. Scale bars are 100 μm. To improve the efficacy of cancer treatment by combined photothermal/chemo therapy, the pHe-responsive surface charge switchable nanocarriers comprising hydrophobic PLGA cores and NAcHis-TPGS coating were developed to selectively transport ICG and DOX. The physiochemical and in vitro cellular uptake patterns suggest that the ICG/DOX-loaded NHTPNs can greatly promote the uptake of cargos by TRAMP-C1 and MCF-7 cancer cells as well as macrophage-like RAW 264.7 cells under weak acidic conditions by means of their enhanced attraction with the negatively-charged cell membrane surfaces, due to the increased protonation of the NAcHis (imidazole) residues on particle surfaces. The results of in vivo and ex vivo biodistribution studies further reveal that the payload-carrying NHTPNs not only substantially accumulated within TRAMP-C1 solid tumor but also actively penetrated into deep tumor hypoxia by virtue of their pHe-triggered near neutral surfaces and the additional hitchhiking transport via TAMs. The results of in vivo animal study demonstrates the sound imaging-guided photothermal effects of ICG/DOX-loaded NHTPNs on inducing extensive cell necrosis and apoptosis and enhancing additional DOX chemotherapy, thereby prominently inhibiting tumor growth and recurrence. Over all, the ICG/DOX-loaded NHTPNs featured with a superior tumor accumulation/uptake and photothermal/chemo dual-modality therapy show great promise in improving cancer theranosis. Figures S1-10 and Table S1. This work is supported by the Ministry of Science and Technology, Taiwan (MOST 102-2221-E-007-032-MY3, 102-2221-E-007-133-MY3 and 103-2221-E-007-023) and National Tsing Hua University, Taiwan (104N2046E1 and 104N2742E1).